This was one of those movies that I didn't have any interest in initially and had no idea what the story was about, aside from baseball. It exceeded expectations, but only slightly. Probably not something that I'd willingly go into again, and frankly in the muddling middle as far as inspiring sports movies go. The plot, in case you too don't know, is about a 44-year-old general manager for the Oakland A's, played by Brad Pitt, and a geeky 25-year-old Yale grad, played by Jonah Hill. The two decide to recruit baseball players solely on the basis of number of runs and cost of the player. Essentially, they revolutionize the baseball system (don't ask me about how this is used in real life today though). Along the way you get the typical underdog story, with the sudden comeback and the bittersweet ending. In fact, the ending definitely confused me the most. I felt like the point they were trying to make just couldn't quite be backed up with the real life story, so they tried to extrapolate some meaning into the movie. Which is always obvious to the audience and leads to oddity. And who understood the last lyrics to the daughter's song? Was that meant to be funny? Factual? At many points the movie definitely drags. There's a great deal of time wasted on relatively meaningless scenes, including many of the daughter scenes. I get the director's trying to portray Brad as a super loving dad/ lonely average guy with a child to support, but the moments stretched too long and were frankly useless to our story. 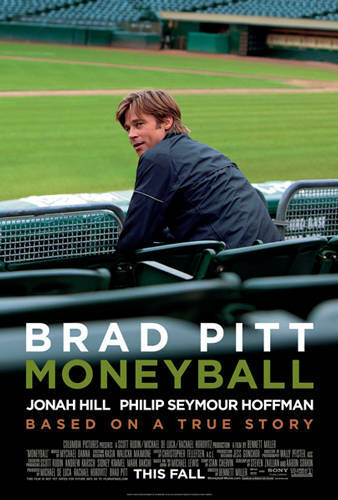 Moneyball is definitely no Remember the Titans. While the latter made me cry and had the perfect mix of realistic humor, well-rounded characters and an inspiring but sad ending, the former makes use of awkward humor (courtesy of Jonah, whom I now adore), 2-D characters that we never really get to know well enough to care for, and a confusing, unsatisfying conclusion. Like most sports films, this is a guys-dominated screen show. Even more accurately, this is a middle-aged men dominated event. It's pretty much all plump white men arguing back and forth. While Brad is still Brad, he's definitely aged and it shows tremendously in this film. I find it hard to believe that he did Benjamin Button merely a few years ago, as his looks have changed drastically since (or maybe he just skipped the makeup and photoshop here). 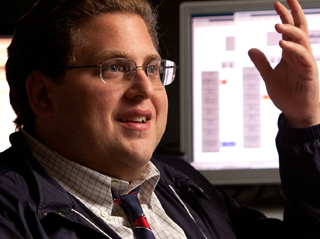 Jonah Hill is pretty much the single comic, fun-to-watch thing on the screen. Brad's character gets a bit aggravating at times, but Jonah's is constant and hilariously honest throughout. The bromance here is certainly amongst the best, and I'm really happy that the two also seem friends in real life (Jonah's losing weight with Brad's help apparently). Overall, this movie is about a B. Nothing stands out about it, it's inspiring but easily forgettable, and the plot is a solid meh.